A new study by an international team of investigators led by Dana-Farber Cancer Institute scientists is the first to demonstrate that chemotherapy and a new, targeted therapy work better in combination than chemotherapy alone in treating patients with the most common genetic subtype of lung cancer. Published online on November 28, 2012 in The Lancet Oncology, the combination of chemotherapy and the targeted drug selumetinib was more effective than chemotherapy alone in a clinical trial involving patients with a form of non-small-cell lung cancer (NSCLC) that carries a mutation in the gene KRAS – a variety that represents about 20 percent of all NSCLC cases. Previously, no targeted agent, either alone or in combination with another drug, had proven beneficial in a trial involving patients with this type of NSCLC. The 87 patients who participated in the new, phase II trial – conducted at 67 sites around the world – had advanced, KRAS-mutant NSCLC that had failed initial chemotherapy. The participants were randomly assigned to receive either selumetinib and the chemotherapy agent docetaxel or docetaxel alone. Investigators found that while 37 percent of the patients in the selumetinib group experienced some shrinkage of their tumor, none of the patients in the docetaxel-only group did. Of particular significance, patients receiving selumetinib lived a median of 5.3 months before their cancer began to worsen, compared to 2.1 months for those receiving chemotherapy alone. (Patients in the selumetinib group also survived longer, on average, than those in the docetaxel group – 9.4 months compared to 5.2 months – but the improvement was not considered statistically significant.) "Our findings suggest that selumetinib and docetaxel work synergistically – each enhancing the effect of the other," says the study's lead author, Pasi A. Are juicier, sweeter, more disease-resistant watermelons on the way? An international consortium of more than 60 scientists from the United States, China, and Europe has published the genome sequence of watermelon (Citrullus lanatus) — information that could dramatically accelerate watermelon breeding toward production of a more nutritious, tastier, and more disease-resistant fruit. The watermelon genome sequence was published in the November 25, 2012 online version of Nature Genetics. The researchers discovered that a large portion of disease-resistance genes were lost in the domestication of watermelon. With the high-quality watermelon sequence now complete, it is hoped that breeders can now use the information to recover some of these natural disease defenses. The authors reported that the genome of the domesticated watermelon contained 23,440 genes, roughly the same number of genes as in humans. The group compared the genomes of 20 different watermelons and developed a first-generation genetic variation map for watermelon. This information allowed them to identify genomic regions that have been under human selection, including those associated with fruit color, taste, and size. “Watermelons are an important cash crop and among the top five most consumed fresh fruits; however, cultivated watermelons have a very narrow genetic base, which presents a major bottleneck to its breeding. Decoding the complete genome of the watermelon and resequencing watermelons from different subspecies provided a wealth of information and toolkits to facilitate research and breeding,” said Dr. Zhangjun Fei, a scientist at the Boyce Thompson Institute (BTI) for Plant Research at Cornell University, and one of the leaders of this project. Dr. Fei worked with BTI scientists on different aspects of the research, including Dr.
As a homeowner prepping for a hurricane, the bacterium Bacillus subtilis uses a long checklist to prepare for survival in hard times. In a new study, scientists at Rice University and the University of Houston uncovered an elaborate mechanism that allows B. subtilis to begin preparing for survival, even as it delays the ultimate decision of whether to “hunker down” and withdraw into a hardened spore. The new study by computational biologists at Rice and experimental biologists at the University of Houston was published online on November 19, 2012 in PNAS. “The gene-expression program that B. subtilis uses to form spores involves hundreds of genes,” said Dr. Oleg Igoshin, lead scientist on the study and professor of bioengineering at Rice. “Many of these genes are known and have been studied for decades, but the exact mechanism that B. subtilis uses to make the decision to form a spore has remained a mystery.” B. subtilis is a common soil bacterium that forms a spore when food runs short. Spore formation involves dramatic changes. The cell first asymmetrically divides within its outer wall, forming one large chamber and one small one. As spore formation progresses, one chamber envelopes the other, which becomes a vault for the organism’s DNA and a small set of proteins that can “reboot” the organism when it senses that outside conditions have improved. B. subtilis is harmless to humans, but some dangerous bacteria like anthrax also form spores. Scientists are keen to better understand the process, both to protect public health and to explore the evolution of complex genetic processes. During spore formation, scientists know that a bacterium channels its energy into producing proteins that help prepare the cell to become a spore. Discovery of a new drug with a high potential to treat Ewing sarcoma, an often deadly cancer of children and young adults, and the previously unknown mechanism behind it, come hand-in-hand in a new study by researchers from Huntsman Cancer Institute (HCI) at the University of Utah. The report appeared November 26, 2012 online in the journal Oncogene. “Ewing sarcoma is almost always caused by a cancer-causing protein called EWS/FLI," said Stephen Lessnick, M.D., Ph.D., director of HCI's Center for Children's Cancer Research, professor in the Department of Pediatrics at the University of Utah School of Medicine, and an HCI investigator. In the lab, Dr. Lessnick and his colleagues found that an enzyme, called lysine-specific demethylase (LSD-1), interacts with EWS/FLI to turn off gene expression in Ewing sarcoma. By turning off specific genes, the EWS/FLI-LSD1 complex causes Ewing sarcoma development. "This makes LSD-1 an important target for the development of new drugs to treat Ewing sarcoma," Dr. Lessnick said. "For a long time, we've known that EWS/FLI works by binding to DNA and turning on genes that activate cancer formation," said Dr. Lessnick. "It was a surprise to find out that it turns genes off as well. The beauty, if there's anything beautiful about a nasty disease like this, is that if we can inhibit EWS/FLI, we can inhibit this cancer, because EWS/FLI is the master regulator of Ewing sarcoma," Dr. Lessnick added. While Dr.
A new cancer drug combination demonstrated significant improvement in overall survival of late-stage pancreatic cancer patients compared to those receiving standard treatment, according to results of a Phase III clinical trial led by physicians from Scottsdale Healthcare's Virginia G. Cancer Center Clinical Trials, a partnership with the Translational Genomics Research Institute (TGen). Physicians at the Virginia G. Piper Cancer Center at Scottsdale Healthcare were first to design a clinical trial to determine the safety, tolerability, and effectiveness of nab-paclitaxel (Abraxane) in combination with the standard drug gemcitabine in patients with advanced pancreatic cancer. Results of that multicenter study chaired by Dr. Daniel Von Hoff were encouraging enough that it led to one of the largest international studies ever done in pancreatic cancer, with 861 patients. Full results are expected to be presented at the American Society of Clinical Oncology (ASCO) 2013 Gastrointestinal Cancers Symposium January 24-26, 2013 in San Francisco. "This is a great example of rapid bench-to-bedside development of new treatments for cancer. 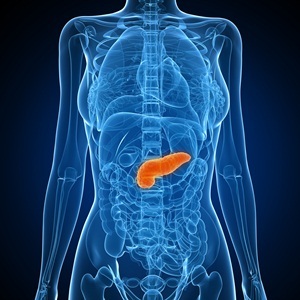 We're ecstatic that we will have a new treatment for patients with late stage pancreatic cancer," said Dr. Von Hoff, international lead investigator and Chief Scientific Officer for the Virginia G. Cancer Center Clinical Trials at Scottsdale Healthcare and TGen's Physician-in-Chief. The pancreas is a gland behind the stomach that secretes enzymes into the upper part of the small intestine to help digestion. It also produces hormones, including insulin, which helps regulate the metabolism of sugars. Advanced pancreatic cancer is the fourth most common cause of cancer death in the United States and throughout the world. It is a difficult to diagnose and treat cancer with the lowest survival rates among all cancer types. The molecular mechanisms whereby a spectrum of dahlias, from white to yellow to red to purple, get their color are already well known, but the black dahliahas hitherto remained a mystery. Now, a study published November 23, 2012 in BioMed Central's open-access journal BMC Plant Biology reveals for the first time that the distinctive black-red coloring is based on an increased accumulation of anthocyanins as a result of drastically reduced concentrations of flavones. Dahlia variabilis hort. is a popular garden flower. Continuous dahlia breeding worldwide has led to the availability of a huge number of cultivars – 20,000 varieties – many of them showing red hues. However, black hues of dahlia flowers occur rarely, in comparison. Flower color in dahlias is exclusively based on the accumulation of a group of metabolites called flavonoids, for example anthocyanins, flavones, and flavonols. It's known that red tones arise from anthocyanins, whilst white and yellow tones lack anthocyanins but contain large amounts of flavones and chalcones respectively. Flavones and flavonoids are colorless, but they influence flower coloration by acting as co-pigments, interacting with anthocyanins to stabilize their structures. It is assumed that flavones rather than flavonols are the predominant co-pigments present in dahlias because all cultivars show high flavone synthase II (FNS) enzyme activity and low flavonol synthase activity. To examine the biochemical basis for the distinctive dark coloring of the black dahlia, the research team from the Vienna University of Technology in Austria used pigment, enzyme, and gene expression analyses. They determined that the majority of black cultivars have very low concentrations of flavones, as confirmed by low FNS II expression. In a breakthrough for nanotechnology and multiple sclerosis, a biodegradable nanoparticle turns out to be the perfect vehicle to stealthily deliver an antigen that tricks the immune system into stopping its attack on myelin and halt a model of relapsing remitting multiple sclerosis (MS) in mice, according to new Northwestern Medicine research. The new nanotechnology also can be applied to a variety of immune-mediated diseases including type 1 diabetes, food allergies, and airway allergies such as asthma. In MS, the immune system attacks the myelin membrane that insulates nerves cells in the brain, spinal cord, and optic nerve. When the insulation is destroyed, electrical signals can't be effectively conducted, resulting in symptoms that range from mild limb numbness to paralysis or blindness. About 80 percent of MS patients are diagnosed with the relapsing remitting form of the disease. The Northwestern nanotechnology does not suppress the entire immune system as do current therapies for MS, which make patients more susceptible to everyday infections and higher rates of cancer. Rather, when the nanoparticles are attached to myelin antigens and injected into the mice, the immune system is reset to normal. The immune system stops recognizing myelin as an alien invader and halts its attack on it. "This is a highly significant breakthrough in translational immunotherapy," said Dr. Stephen Miller, a corresponding author of the study and the Judy Gugenheim Research Professor of Microbiology-Immunology at Northwestern University Feinberg School of Medicine. "The beauty of this new technology is it can be used in many immune-related diseases. We simply change the antigen that's delivered. The holy grail is to develop a therapy that is specific to the pathological immune response, in this case the body attacking myelin," Dr.
Stanford University School of Medicine scientists have demonstrated, in a study conducted jointly with researchers at Yale University, that induced-pluripotent stem cells (iPS cells) — the embryonic-stem-cell lookalikes whose discovery a few years ago won this year's Nobel Prize in medicine — are not as genetically unstable as was thought. The new study, which was published online on Novenber 18, 2012 in Nature, showed that what seemed to be changes in iPS cells' genetic makeup — presumed to be inflicted either in the course of their generation from adult cells or during their propagation and maintenance in laboratory culture dishes — instead are often accurate reflections of existing but previously undetected genetic variations among the cells comprising our bodies. That's good news for researchers hoping to use the cells to study disease or, someday, for regenerative medicine. But it raises the question of whether and to what extent we humans are really walking mosaics whose constituent cells differ genetically from one to the next in possibly significant respects, said Alexander Urban, Ph.D., assistant professor of psychiatry and behavioral sciences at Stanford. Dr. Urban shared senior authorship of the study with bioinformatics professor Mark Gerstein, Ph.D., and neurobiology professor Flora Vaccarino, M.D., both of Yale. It's only a few years ago that human iPS cells started becoming available to researchers. These cells hold great promise because they act almost exactly like embryonic stem cells, which can be nudged to differentiate into virtually any of the body's roughly 200 different cell types. But iPS cells can be derived easily from a person's skin, alleviating numerous ethical concerns arising from the necessity of obtaining embryonic stem cells from fertilized eggs. A gene so powerful it nearly triples the risk of Alzheimer's disease has been discovered by an international team including researchers from the Mayo Clinic. It is the most potent genetic risk factor for Alzheimer's identified in the past 20 years. The findings were reported November 14, 2012 in the online edition of the New England Journal of Medicine. The team included researchers from 44 institutions around the world, including 10 from the Mayo Clinic's campuses in Florida and Minnesota. The study was led by John Hardy, Ph.D., a researcher at the Institute of Neurology at University College London and a former professor at Mayo Clinic in Florida. The researchers used new sequencing techniques to home in on the TREM2 gene. Additional TREM2 sequencing was then performed, in part, by scientist Dr. Aleksandra Wojtas in the Mayo Clinic in Florida laboratory of Rosa Rademaker, Ph.D. These studies led to identification of a set of rare variants in TREM2 that occurred more often in 1,092 Alzheimer's disease patients than in a control group of 1,107 healthy people. The most common variant, R47H, was then evaluated in follow-up studies of a large number of Alzheimer's disease patients and controls. Minerva Carrasquillo, Ph.D., a scientist in the Mayo Clinic in Florida laboratory of Steven Younkin, M.D., Ph.D., spearheaded the direct genotyping and analysis of R47H in DNA samples from 1,994 Alzheimer's disease patients and 4,062 "control" participants — individuals verified not to have Alzheimer's. The patients and control participants were evaluated by Mayo Clinic physicians, led by co-authorsDennis Dickson, M.D., Neill Graff-Radford, M.D., and Ronald Petersen, M.D., Ph.D. Insights from a genetic condition that causes brain cancer are helping scientists better understand the most common type of brain tumor in children. In new research, scientists at Washington University School of Medicine in St. Louis have identified a cell growth pathway that is unusually active in pediatric brain tumors known as gliomas. They previously identified the same growth pathway as a critical contributor to brain tumor formation and growth in neurofibromatosis-1 (NF1), an inherited cancer predisposition syndrome. "This suggests that the tools we've been developing to diagnose and treat NF1 may also be helpful for sporadic brain tumors," says senior author David H. Gutmann, M.D., Ph.D., the Donald O. Schnuck Family Professor of Neurology. The findings were published online on November 14, 2012 in Genes & Development. 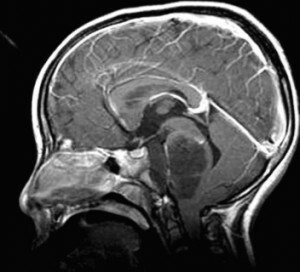 NF1 is among the most common tumor predisposition syndromes, but it accounts for only about 15 percent of pediatric low-grade gliomas known as pilocytic astrocytomas. The majority of these brain tumors occur sporadically in people without NF1. Earlier research showed that most sporadic pilocytic astrocytomas possess an abnormal form of a signaling protein known as BRAF. In tumor cells, a piece of another protein is erroneously fused to the business end of BRAF. Scientists suspected that the odd protein fusion spurred cells to grow and divide more often, leading to tumors. However, when they gave mice the same aberrant form of BRAF, they observed a variety of results. Sometimes gliomas formed, but in other cases, there was no discernible effect or a brief period of increased growth and cell division. In other studies, the cells grew old and died prematurely. Dr.